1060 West Addison: Cubs Blog | Chicago Cubs news, links, poetry, and musings from Andrew Shaffer, author of GREAT PHILOSOPHERS WHO FAILED AT LOVE (Harper Collins, 2011). One of MLBlogs Top 100 baseball blogs for 2008! Chicago Cubs news, links, poetry, and musings from Andrew Shaffer, author of GREAT PHILOSOPHERS WHO FAILED AT LOVE (Harper Collins, 2011). One of MLBlogs Top 100 baseball blogs for 2008! It’s Old Style Day — Or Is It? 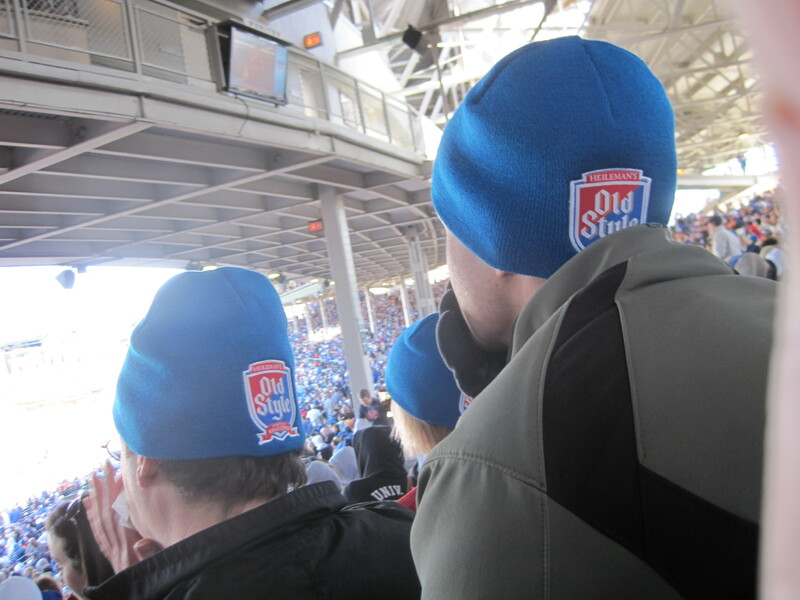 It was “Old Style Stocking Cap Day” at Wrigley Field last Saturday. The first 10,000 adults received one of these bad boys. I’ve always thought of Old Style as the “official” beer of the Chicago Cubs, as the Milwaukee brewer and the Cubs are longtime advertising partners. But then the Cubs took money from Anheuser-Busch in 2008 and renamed the bleachers the “Bud Light Bleachers.” And now there’s a Miller Light sign across the street in rightfield that you can’t miss. The Cubs appear to be more than happy to lay down with whichever brewer has the cash. to Wrigley. You won’t find Guinness or anything mildly adventurous within the ballpark. Perhaps the fan who tossed his beer onto the Phillies’ Shane Victorino last August was simply voicing his displeasure with Wrigley’s increasingly limited offerings. 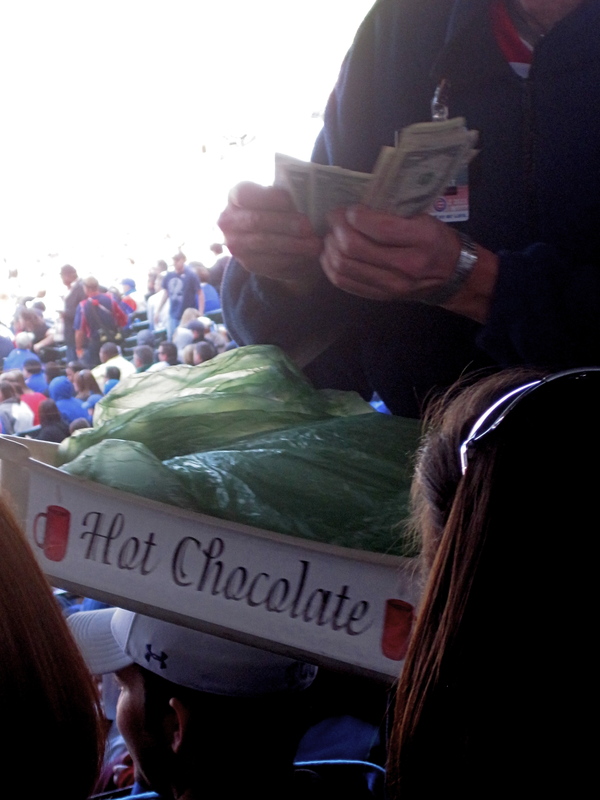 Whatever the beer that the Cubs endorse is, the price has steadily increased by a quarter every year for the past six years. Whether you drink a Bud Light, Old Style, or Miller, you’re going to be set back $6.75 a cup this year. The Cubs’ bullpen coughed up five runs in one inning last night in their first trip to the Mets’ new ballpark. And after another quality start from a Cubs’ starter, as six innings of one-run ball from Randy Wells were thrown away. Half of Chicago’s relief pitchers have an ERA over 5.00; Samardzija has an ERA of 18.90. Why not let a few position players toss a few innings this week and see what happens? Marlon Byrd, I’m looking at you. “It would be nice to win this right now,” Ron Santo said in the bottom of the 9th inning with Jeff Baker at the plate, two men on and two outs. Baker popped out and Cubs reliever Sean Marshall gave up the winning run in the 10th inning. 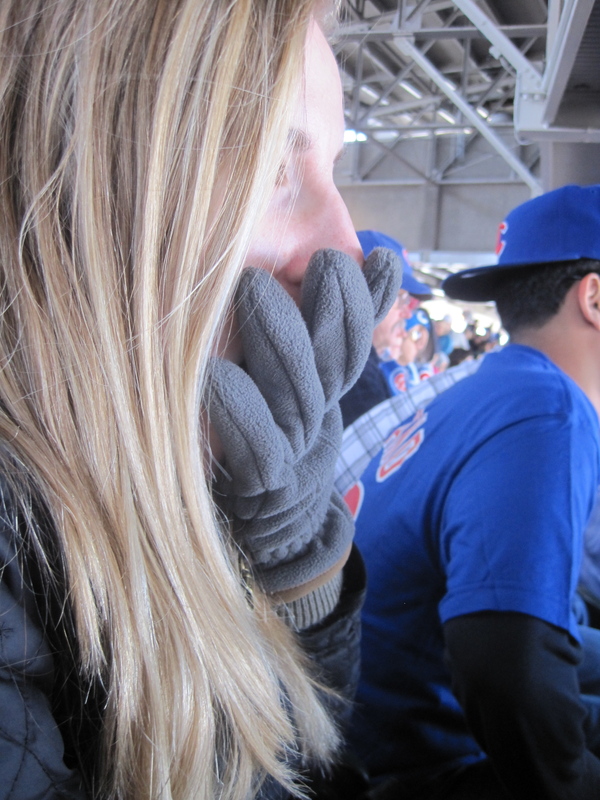 The baseball gods weren’t in a very nice mood, at least as far as Cubs fans were concerned. The extra innings didn’t stretch out like in the Mets-Cardinals game in St. Louis on Saturday. Twenty innings, the first 18 of which were scoreless? Outfielders taking the mound? I don’t think anyone likes to see a game go to the extra innings. Players, managers, coaches, and announcers don’t get paid anything extra. Ballparks stop serving beer after the 7th inning usually, so every extra inning played feels like prohibition-era baseball. Baseball without beer is like a movie without popcorn. The worst baseball game I saw was a 15-inning Cubs-Cardinals game at Wrigley a couple of years ago during the Sammy Sosa years. The Old Style stopped flowing after the 7th inning, and fans began to get restless as the game dragged on in the 90-degree July weather. By the middle of the 15th, my dad and I decided to leave — neither team showed any signs of life, and the sun was leaving its mark on those of us left in the bleachers. As we walked out of the ballpark dreaming of our car’s air conditioning, we heard the crowd roar behind us. After an 0-for-6 day in which he had failed to connect countless times with men in scoring position, Sammy Sosa had hit a game-winning home run in the bottom of the 15th. We shook our heads in frustration. It would have been nice to have seen the home run, but it would have been even nicer to have had it happen in the 9th inning. But, as Santo and Cubs fans know, the baseball gods aren’t always nice. Should the Cubs Pay Soriano to Not Play? The Cubs can’t get offense out of Alfonso Soriano (hitting .214 through nine games this year, not to mention the .241 average that he boasted in 2009). Defense is out of the question (two embarrassing outfield gaffs on Wednesday alone, causing Lou to yank him late in the game; he led all leftfielders in the Majors in errors in 2009). Will Chicago eat his $18 million a year contract and release him before it expires after the 2014 season? GM Jim Hendry, speaking to MLB Network Radio this morning, says “no.” Due to the size of the contract, a trade is out of the question….and who would want Soriano anyway? Cubs fans thought all of the same things about Milton Bradley last year. But, lo and behold, the Seattle Mariners came calling…and so far, that trade looks to have worked out for both sides (Milton’s production is up in Seattle, although his attitude is unchanged; Carlos Silva has been outpitching Carlos Zambrano on the Northside). If no one comes a-calling for Soriano, though, the Cubs should drop him from the 25-man roster…but not release him from his contract. I know there are clauses in MLB contracts which would prevent them from doing this, but I’m sure the Cubs could find some way around them for the amount of money involved. Jim Hendry should keep him around and make him work off that $18 million a year as a batboy. Sure, he Soriano wouldn’t hustle to fetch the bats, which would slow games down and make umpire Joe West angry. I could also see fans booing Soriano for every bat that he drops on his way back to the dugout… Actually, that might not work out after all. Whatever happens, don’t expect the Cubs to be content with letting their one-time franchise player drive his Bentley off into the sunset with over $60 million left on his contract. Who didn’t see this coming? Not even halfway through the first year of a 3-year, $30-million contract with the Cubs, the beleaguered Milton Bradley finally came face-to-face with Sweet Lou. “Words were exchanged” in the purely verbal altercation that followed Bradley’s latest temper trantrum in the dugout. Sweet Lou sent Bradley home for the day. “It’s something I promise won’t be happening again,” Cubs GM Jim Hendry said of Bradley’s tantrum to MLB.com. Without recounting Bradley’s extensive history of outbursts, tantrums, ejections, mysterious injuries, et al, suffice to say that this will be happening again. Milton Bradley has never been 100 percent anything in his big league career. The only question now is if there is how much of Bradley’s contract the Cubs will have to eat when they cut ties with him for good. cubfan_joe on Who Remembers Corey Patterson? brandocubs on Who Remembers Corey Patterson? cubfan_joe on Cubs to Install Jumbotrons?